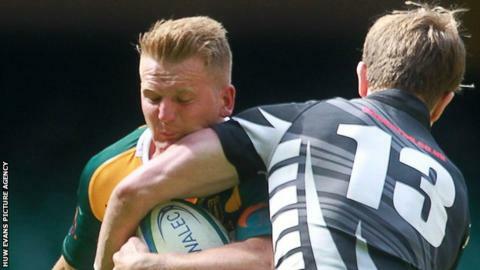 Two Welsh rugby union players have been suspended from all sport after failing drugs tests. Merthyr Rugby Club's Owen Morgan, 25, and Greg Roberts, 28, of Glynneath RFC have been banned for four years and two years respectively. Morgan tested positive for the anabolic steroid drostanolone and the stimulant benzoylcgonine, a metabolite of cocaine. Roberts tested positive for tamoxifen, which can be used for cancer treatment. Morgan's positive finding followed an in-competition test on 7 March 2015 after a match between Bridgend Athletic and Merthyr in Swalec Division One West. Morgan is banned from all sport for four years from 2 April 2015 until midnight on 1 April 2019. Roberts' positive sample came as a result of an in-competition test on 14 February 2015 after a match between Glynneath and RGC1404 in Swalec Division One West. Roberts is banned from all sport for two years from 11 March 2015 until midnight on 10 March 2017. "By making the wrong choices, Owen Morgan and Greg Roberts have cheated themselves, their team-mates and their sport," said Nicole Sapstead, UK Anti-Doping's chief executive. "Not only have they damaged their sporting careers but they have put their health at risk. "Our primary focus remains on taking a preventative approach to doping by working to eradicate the source of the problem. "We do this in partnership with national governing bodies of sport, educating athletes on the risks they take if they decide to take drugs and helping them to make the right choices based on the true spirit of sport." The full written decision can be found under current sanctions on the UKAD website. "These bans serve as a strong warning to everyone in the game that non-compliance with anti-doping rules carries grave consequences," said Welsh Rugby Union chief executive Martyn Phillips. "There is no place for doping within sport, and it certainly doesn't fit in with the values of rugby union. Whether intentional, or inadvertent, players have a responsibility to themselves, to each other, to their clubs and to the sport to act within the rules and spirit of the game. "We work closely with UK Anti-Doping and fully adhere to the World Anti-Doping Code. There is no room in the code for carelessness or not knowing, and players are encouraged to check the prohibited lists, found via the WRU website which include over-the-shelf medication and supplements. "We want to rid our game of these practices and we encourage anyone who has any intelligence of doping taking place to call the WRU or UKAD and help protect our game."